The late-December The New York Times deep dive into the reasons behind the MTA’s massive cost problem was met with an odd degree of silence among the corridors of power in New York City. Albany, ostensibly tasked with oversight of the MTA, failed to convene a single hearing on the topic, and while the MTA has recently made noises about a task force fronted by RPA Chair (and MTA Board member) Scott Rechler that will dig in on these issues, the agency itself hasn’t said much about the conclusions from Brian Rosenthal’s series. The feds though are interested. The Government Accountability Office said on Wednesday that it was preparing to launch a study of why transit construction is so much more expensive in the United States than in other parts of the world. Special attention is expected to be paid to New York City, where recent projects have cost far more than anticipated. Auditors plan to examine contracting policies, station design, project routing, regulatory barriers and other elements that drive cost, comparing practices in different cities in the United States and abroad, officials said. A final report with recommendations is to be issued by the end of the year. The study was part of the spending bill that was approved by Congress last week. And it comes three months after an investigation by The New York Times revealed how city and state public officials had stood by as a small group of politically connected labor unions, construction companies and consulting firms drove up transit construction costs and amassed large profits. The first phase of the Second Avenue subway on the Upper East Side of Manhattan, for instance, cost $2.5 billion for each mile of track. Another project known as East Side Access, which will carry the Long Island Rail Road to Grand Central Terminal through a 3.5-mile tunnel, is on pace to cost $3.5 billion per track mile. Elsewhere in the world, a mile of subway track typically costs $500 million or less. Despite these protestations, the GAO study is guardedly good news if it helps realize substantial progress in combating costs. In reality, Rosenthal’s initial reporting in December highlighted why everything cost so much. The next step isn’t to study these costs again but rather to identify ways to lower costs and combat what I call organized corruption. Plus, as Yonah Freemark noted on Twitter, the cost problem isn’t just related to transit in New York City; every major construction project throughout the country costs more than their European or Asian counterparts. Still people are paying attention, and that can hopefully be the first steps on the path toward much needed reform. Whether you want to hold your breath on this one, though, is entirely up to you. A note to readers: For 12 years, I’ve run this site through minimal ad revenue and as a labor of love. Lately, ads started interfering with the site, and I’ve decided to try to support this site via a reader-supported model. To that end, I have started a Patreon for Second Ave. Sagas. If you like what you read and want more of it (including the return of my podcast), please consider a monthly donation. Thank you. Why do New York rail construction projects cost so much? In essence, with a $5-$6 billion tag attached to Phase 2 of the Second Ave. Subway on the horizon (let alone the recent politicking over the fate of the Gateway Tunnel), this is the big question plaguing New York. With limited dollars not going nearly as far as they do the world over, the MTA’s cost problems are a significant barrier to New York City transit expansion. For years, those watching the MTA have rung the alarm on the agency’s high construction costs. I’ve written about cost concerns and the ever-increasing budgets for big-ticket MTA capital projects for years, and I’m not alone. Alon Levy has, since this post in 2011, charted the absurd costs of U.S. rail construction in detailed comparisons with international peers, and Stephen Smith, via the @MarketUrbanism twitter feed, has beaten the cost drum. When challenged, MTA officials have acknowledged that construction costs, but no one has tackled the twin issues of cost transparency and cost control. No one, that is, until last week, when The Times ran a massive front-page story charting all the reasons why NYC transit construction are so high. As the finale in the series that started with an in-depth look at our unfolding transit crisis, Brian Rosenthal, with help from Doris Burke and Alain Delaquérière, has done what the MTA or the New York State Comptroller should have done years ago: They scrutinized MTA spending and took a deep dive into the agency’s contracting practices, staffing policies and lack of productivity in a way that lays bare just how bad the MTA is at managing big-ticket construction projects or getting a good return on its dollar. The article is, essentially, the story of how institutionalized corruption has become the norm in New York City. I highly urge you to read the entire piece and peruse through my instant reaction Twitter thread from Friday. I’ll excerpt a bit here. Construction companies, which have given millions of dollars in campaign donations in recent years, have increased their projected costs by up to 50 percent when bidding for work from the M.T.A., contractors say. Consulting firms, which have hired away scores of M.T.A. employees, have persuaded the authority to spend an unusual amount on design and management, statistics indicate. But the contractors said the other issues cited by the M.T.A. were challenges that all transit systems face. Density is the norm in cities where subway projects occur. Regulations are similar everywhere. All projects use the same equipment at the same prices. Land and other types of construction do not cost dramatically more in New York. Insurance costs more but is only a fraction of the budget. The M.T.A.’s stations have not been bigger (nor deeper) than is typical. “Those sound like cop-outs,” said Rob Muley, an executive at the John Holland engineering firm who has worked in Hong Kong and Singapore and visited the East Side Access project, after hearing Mr. Lhota’s reasons. The documents reveal a dizzying maze of jobs, many of which do not exist on projects elsewhere. There are “nippers” to watch material being moved around and “hog house tenders” to supervise the break room. Each crane must have an “oiler,” a relic of a time when they needed frequent lubrication. Standby electricians and plumbers are to be on hand at all times, as is at least one “master mechanic.” Generators and elevators must have their own operators, even though they are automatic. An extra person is required to be present for all concrete pumping, steam fitting, sheet metal work and other tasks. In New York, “underground construction employs approximately four times the number of personnel as in similar jobs in Asia, Australia, or Europe,” according to an internal report by Arup, a consulting firm that worked on the Second Avenue subway and many similar projects around the world. That ratio does not include people who get lost in the sea of workers and get paid even though they have no apparent responsibility, as happened on East Side Access. Mr. Lhota, the M.T.A. chairman, agreed that leaving negotiations to unions and vendors may be problematic. “You’re right; in many ways, there’s this level of connection between the two,” he said. But the chairman said he did not know what could be done about it. Hiring nonunion labor is legal but not politically realistic for the M.T.A. The transit authority could get unions to agree to project-specific labor deals, but it has not. The profit percentage taken by vendors also is itself a factor in the M.T.A.’s high costs. In other parts of the world, companies bidding on transit projects typically add 10 percent to their estimated costs to account for profit, overhead and change orders, contractors in five continents said. Final profit is usually less than 5 percent of the total project cost, which is sufficient given the size of the projects, the contractors said. Things are much different in New York. In a series of interviews, dozens of M.T.A. contractors described how vendors routinely increase their estimated costs when bidding for work. First, the contractors said, the vendors add between 15 and 25 percent as an “M.T.A. Factor” because of how hard it can be to work within the bureaucracy of the transit authority. Then they add 10 percent as a contingency for possible changes. And then they add another 10-12 percent on top of all that for profit and overhead. Firms that donate to politicians and operate a revolving door between their offices and the public sector are the only ones to bid on complex projects and they do so at inflated costs. It’s graft, and whether it’s legal is a big open question mark in my mind. But don’t sleep on MTA ineptitude either; the agency after all hired three “operational readiness” consultants for East Side Access ten years before construction work is set to wrap on the project. The waste and the rot run deep. As you read The Times piece, you may be wondering what happens next. After all, MTA officials have been on the record acknowledging these problems for years, but they never act. Horodniceanu talked about overstaffing on TBM projects years ago, and he never acted. A faction on the MTA Board recently started raising concerns over contracting dollars, but the full board still voted to approve all projects. And the $6 billion Second Ave. Subway phase looms large. As I see it, two people could fix this mess. One is Andrew Cuomo. He could exert the leverage he has over the MTA and the labor unions to get both sides to come to the table on a solution. Unfortunately, he has shown no willingness to challenge union costs, and he has used the MTA for political show only. The other person is New York State AG Eric Schneiderman who could use his office’s legal powers to investigate these contracts and, if legally feasible, start prosecuting all of these players for fraud. That would be a big shock to the New York state construction graft industry but is a reach legally with standards for proving this type of corruption very high these days. Are we stuck then? Is the only outcome a well-deserved Pulitzer nomination for Rosenthal and The Times and vindication for Stephen Smith, Alon Levy, and the thousands of transit nerds who have listened to them over the years? I hope something more comes out of this series of articles. The future of reasonably priced transit projects in NYC depends on it. But even with everything out in the open, corruption has a way of persevering absent a major shock to the system that enabled it in the first place. It’s no small thing for the MTA to opt to shut down a subway station. New Yorkers hate disruption and love convenience, and when the MTA starts adding ten or 15 additional minutes of walking per day — an hour a week — subway riders start grumbling. After enough time, grumbling turns into complaints and complaints turn into resentment, and as Yoda once didn’t say, resentment leads to the Dark Side. All of the talk lately of shutting down subway stations to improve the speed and efficiency of MTA work has led to a rigorous debate in various circles regarding neighborhood and rider preferences. During his remarks two weeks ago on the MTA’s plans to close 30 subway stations for extended periods of time to allow construction crews 24/7 access to that station, MTA CEO and Chairman Tom Prendergast said his customers would prefer a shorter full-time shutdown rather than years of weekend uncertainty and inconvenience. The matter is far from settled, and it will come up again over the next few months as the MTA attempts to determine how best to handle the looming L train shutdown. That work, related to Sandy recovery efforts, is far more extensive than a simple station rehabilitation, and the MTA has little choice but to shutdown the Canarsie Tubes for extended periods of time. It’s nearly impossible for this Fix & Fortify work to do anything other than wreck havoc on Williamsburg, Bushwick and points east, and as real estate speculators circle, the debate over the proper length of any shutdown will rage. The poll I pose tonight focuses more on the 30 stations and less on the L train. As the MTA embarks on a yet another new way to strive toward a State of Good Repair, would you prefer to see stations closed entirely for 3-6 months or closed on weekends for three years? I’m not sure there’s a right or better answer yet, and I’m curious to hear from you, my riders. So vote in the poll and feel free to voice your opinion in the comments. Which station rehabilitation option would you prefer? On Friday morning at the Transit Museum, Gov. Andrew Cuomo announced a series of MTA projects designed to help modernize our subway system. By and large, these initiatives weren’t new as much as they were promises to speed up slow or stalled projects, such as wifi for underground stations, a move to a new fare payment technology, USB charging stations in the subway and B Division countdown clocks. I took a deeper dive into these plans in a rare weekend post that explored the tensions between Cuomo’s lofty rhetoric around expanding transit use and utter modesty of these proposals. I’d urge you to read that for my take. Today, I want to look closer at a different element of his MTA plans. One part of Cuomo’s announcement that drew headlines and consternation involved plans to revise the way the MTA approaches station rehabilitation projects. For years, the MTA has seesawed between full station overhauls and a component-based repair system, often implementing the latter at stations that won’t undergo the former for years (if not decades). You see, with 469 stations — and soon to be 472 — under its purview, at current construction rates as set forth in the current five-year capital plan, it would take the MTA around a century to renovate every station. If only the lives of New York City subway stations were that long. You can see why people might get upset about this. Cuomo sounds like he’s proposing that the MTA shut down 30 subway stations all at once, and New Yorkers — especially those in Astoria where four adjacent subway stations will get this treatment — were concerned about losing access to the subway system for extended periods of time. In subsequent comments, though, Prendergast said that not all stations would be closed at once. The MTA expects to wrap work on these 30 by 2018 for most and by 2020 for a few stragglers. With rehabs expected to last 6-12 months, MTA officials said the agency will plan so subway riders will always have a nearby station. As part of this work, the MTA is going to “revamp the design guidelines for subway stations to improve their look and feel…These cleaner, brighter stations will be easier to navigate, with better and more intuitive wayfinding, as well as a modernized look and feel.” The navigation element confuses me because every single one of the 30 stations is a single- or side-platform one-line station without any transferring or confusing corridors. Some have closed entrances that should be reopened, but streamlining navigation is more applicable to major destinations — which these 30 are not. Hopefully, though, navigation considerations come into play in the agency’s design guidelines, and we’ll learn more about that as the process unfolds. Prendergast explained that, instead of work extending for two or three years on weekends and nights, contractors will be given uninterrupted access to stations within the hopes of completing work much faster. The inspiration is clearly the Fastrack repair program which has led to cost savings and speedier timeframes. Even if the MTA can realize cost savings and find ways to speed up the work, getting through 30 stations in three years still means nearly 50 years before every station is repaired, and those renovated early in the cycle will be well past the point of bad repair by then. It’s a start, then, but is it enough? And that seems to be a common thread with Gov. Cuomo’s MTA proposals. Waiting out the 7 line and Fulton St. while pondering 2nd Ave.
As Monday dawns, the MTA Board Committees will gear up for a full day’s worth of meetings. Despite the fact that the fare is set to rise in March, we won’t hear hand-wringing over the fare hike amounts or even new proposals as, by a few accounts, Gov. Andrew Cuomo is putting pressure on MTA leadership to delay public announcement of any fare hikes and toll increases until after Election Day. There’s nary a mention to be found of the looming rate increases in this month’s Board materials, and usually, the MTA announces the plan in mid-October. What’s done is done — or better yet, what’s not done isn’t done — on that front, and for now, we’ll move on to other things such as what’s up with these never-opening capital projects? October will end this week, and the Fulton St. Transit Center, once expected to open in late June, will remain shrouded in construction. This week’s Board materials offer few clues to the project’s opening. A note in a presentation to the Transit Committee states only that “the Fulton Center Opening date is currently under review” while the opening date is projected to be some time in Q4. Work started, by the way, in December of 2004. Information regarding the 7 line is even harder to find this month. 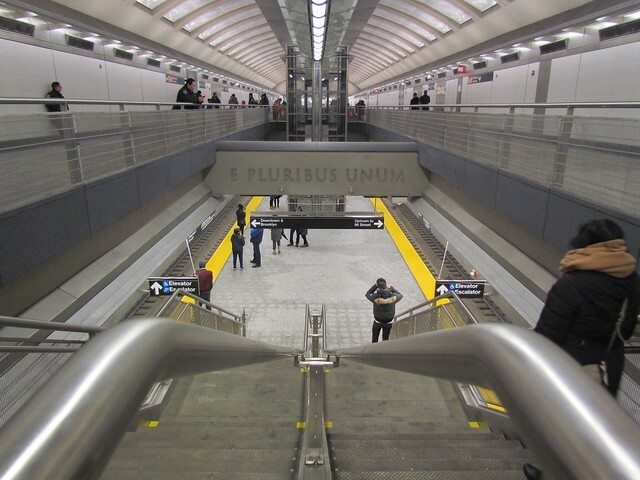 The MTA isn’t offering its Board any further information on the problematic elevators and escalators that have delayed the project, and although we’ve heard February 2015 as an opening date, the latest MTA docs give the agency some leeway. Currently, revenue service is projected to begin during the first quarter of 2015 — which runs through the end of March. The one-stop subway extension was once supposed to be open by the end of 2013, the first quarter of 2014, fall 2014 and then Q4 2014, but now it seems, one way or another, we’ll wait until late winter or even early spring. All of which brings me to the Second Ave. Subway. Construction on the three-stop East Side extension of the Q train is continuing apace, and the MTA still believes they have approximately 26 months left on this project before revenue service begins. The Board materials confidently state a December 2016 ribbon-cutting, and although a few years ago, the feds disputed this projection, the MTA has vowed to open the subway on time. That said, the MTA has also vowed to open the Fulton St. Transit Center on time and the 7 line on time. Given the betting line, wouldn’t you take the “over” on December 2016? I know I would. On a more immediate level, though, as the MTA wants political support for its $30 billion, five-year capital plan, the agency needs to show that they can deliver something somewhere on time or at least learning why they can’t. The aspect of the Fulton St. project that’s being delayed is a fancy headhouse while, seemingly, the complicated underground work has largely wrapped; the 7 line hasn’t opened because of vent fans, inclined elevators and long escalators — hardly technology unique to New York. We won’t know what happens with Second Ave. for another 18-24 months, but whatever remains of the MTA’s capital project credibility is riding on it. The vast majority of New York’s transit experts, advocates and enthusiasts think the city has a cost problem. We have the world’s two most expensive subway stops — in Fulton St. and the World Trade Center PATH Hub — under construction; we have the world’s two more expensive subway lines — in the 7 line and the Second Ave. Subway — under construction; and we have the mess that is East Side Access currently in progress. For over $20 billion (and $10 billion in cost overruns), we’re not getting a lot for our money these days. From where I sit, the cost of these projects is the biggest problem facing future transit expansion. The costs are why ARC was canceled; it’s hard after all to believe that ARC wouldn’t have come in well above when everything else is trending that way. The costs are why New York has to fight tooth and nail for any dollar and why we talk about prioritizing badly needed projects instead of building everything at once as quickly as possible. The costs are why we’re inching outward instead of striding toward expansion. One of the other problems is that no one knows why everything cost so much in New York City. The easy way out is to claim New York exceptionalism. Things cost more in New York because it’s New York. That is, after all, why people pay more to live here than the vast number of Americans would think reasonable, and that is the argument Michael Horodniceanu put forward during his talk on Tuesday night. It’s not a very satisfying answer, and while the MTA Capital Construction president vaguely mentioned work rules, he seems to believe that New York’s costs are reasonable. Horodniceanu also blamed New Yorkers’ intolerant attitudes toward disruption at the surface, which has certainly been a problem in the past, even in unpopulated Central Park. But many of his answers were not so credible, and left me with the distinct impression that not only does the MTA misunderstand why its projects are so expensive, but that the agency doesn’t even necessarily see the high costs as a problem that needs fixing in the first place. “Do you think that it’s a problem?” I asked Horodniceanu of the high costs, after his talk was over. “Is it a problem?” he replied. “Is is a problem that an apartment in New York costs a lot of money?” It was the same answer he gave Grynbaum when on stage. Additionally, Smith recounts a statement from MTA CEO Tom Prendergast who told him that “the cost of construction is what the cost of construction is.” Neither man has a particularly satisfying answer, but in a way, there is an element of politics involved. The MTA Chairman and the head of Capital Construction can’t bemoan high costs on the one hand while asking the state to support a $25 billion five-year capital plan on the other. The optics would be horrible. Still, if New York is serious about transit expansion, the costs have to come down. We can’t support the current regime, and hopefully, behind closed doors, someone smart is working on this problem. We need more of the Second Ave. Subway, but how much are we willing to pay for it? Sporting his trademark bowtie, Dr. Michael Horodniceanu took the stage last night at a Transit Museum-sponsored event to discuss the MTA’s two capital programs that are due to come online this year. He presented about the ins and outs, the designs and challenges, and the impacts of both the 7 line extension and the Fulton St. Transit Center. While the presentation trod well-worn ground, a subsequent Q-and-A with New York Times reporter Michael Grynbaum revealed some of the limitations affected future transit growth. MTA Capital Construction does a reasonably good job at fulfilling its mandate, but beyond projects that are in progress and funded, the future remains murky. Over the past few years, I’ve constantly stressed the need for a transit champion. We have, for instance, the 7 line extension because the city under Mayor Michael Bloomberg foot the bill; we have the Fulton St. Transit Center because the federal government contributed nearly $1.5 billion to first rebuild Lower Manhattan and then later to bolster the economy. We have East Side Access because Al D’Amato and George Pataki fought for it, and we have the Second Ave. Subway thanks, in part, to Chuck Schumer’s efforts. Everything else we don’t have because no one came to fight for it. In a way, that’s what Horodniceanu discussed during the interview segment of the presentation. Grynbaum pushed the MTA Capital Construction president on transit expansions we’ve discussed here. Will we have light rail, perhaps in Staten Island, or a subway to Laguardia? Nothing’s happening there, Horodniceanu said, vaguely referring to the late 1990s NIMBY opposition to the N train extension to Laguardia. In other words, no politicians are stepping up to the plate, and the MTA isn’t about to stick its neck out for such a plan without solid support in Albany or City Hall. What about the 7 train? As we well know, the original plan called for a station at 41st St. and 10th Ave. that was cut due to budgetary concerns. Even a shell station met the axe, and the MTA has left in place the barest of provisions for a future side-platform station. Furthermore, the tail tracks extend down to 26th St. and 11th, and it would have been relatively easy to extend the train to 14th St., perhaps to a meeting with the L.
At one point, as Grynbaum pressed the issue, Horodniceanu spoke about the other part of the equation — costs — and he ducked and dodged as best as he could. Things are just more expensive in New York City, he claimed, but he made some concessions toward labor laws and work rules that burden construction projects with what many would call overstaffing. Still, costs seemed nearly besides the point Horodniceanu was trying to make. If no one will fight for the project, it’s not going to happen. In closing, Horodniceanu joked that he hopes he’s still live when East Side Access and the Second Ave. Subway are completed. I hope I am too, and I’m less than half the good doctor’s age. He also seemed to indicate that nothing is next without political support. We have our wishlist of projects, and the MTA kinda sorta has theirs. But until funding and a champion materialize, we’ll be left to dream of an era in which the MTA built out our transit network. It all could be coming to end within the next decade. Where are the champions? Last week was a rough one for MTA Capital Construction. A few hours after we learned that East Side Access will cost $10 billion and will be delayed until 2021, the MTA’s Board materials revealed the news that the 7 line extension wouldn’t be opening in June after all. It could be ready by September; it could be ready by the fourth quarter of 2014. Either way, it wasn’t a good way to end the week. Over the past decade, delays and cost overruns have become the norm. The first phase of the Second Ave. Subway was supposed to be in service a few years ago; the 7 line was originally proposed for the 2012 Olympics; the Fulton St. Transit Center had an initial opening date of 2007. On a smaller scale, we’ve seen station rehabs fall months, or in some cases years, behind schedule, and something as simple as a staircase redo or an elevator repair can seem endless. The litany of missed deadlines and cost overruns for only the MTA’s megaprojects could fill a post, and I’m not going to recite them here again. Everything is late, and nothing is on budget. The latest news though has New Yorkers casting a wary eye toward Second Ave. If these other projects are late, can we reasonably expect the Second Ave. Subway to open on time in December of 2016? That question itself has no easy answer, and there’s some controversy behind it. Back in July of 2009, a federal report questioned the MTA’s own timelines. While the MTA’s worst-case scenarios then predicted an opening date of July 2017, the feds didn’t see the project reaching completion prior to August 2017 and noted that construction could stretch into 2018. The MTA aggressively disputed that account. In materials released for Monday’s meetings, the MTA reiterated its 2016 launch date for the Second Ave. Subway, but should we expect it? I don’t have a firm answer, but with history as our guide, I’m not placing any bets. The MTA hasn’t delivered a major project on time yet (and we can dispute whether a 2016 launch date for the East Side’s new subway line should even be considered “on time”). I’m struck though by something Horodniceanu said when discussing the Fulton St. Transit Hub back in 2009. “What I present today,” he said of plans to open the new hub in 2014, “I stand by. I expect you to hold me accountable to it.” This came years before a bunch of politicians called the 7 line extension “on time and on budget” a few weeks ago. It was a laughable claim then just as it is now. The appeal to accountability is the irony in Horodniceanu’s five-year-old statement as public accountability, at least, has been lacking. No one has been held accountable for the failure to realize deadlines, and nothing much has changed over the past decade of capital works. Later on Monday, Horodniceanu will take the spotlight when he presents the latest on East Side Access, and the accountability should start now. If our transit network is to expand, the MTA has to figure out why these projects’ initial budgets and timelines are so wrong and how it can avoid these problems in the future. After a bad week, New Yorkers needs that accountability now more than ever. While traveling from Herald Square to Chinatown last night for dinner, I had the opportunity to ride the R train for the first time in this post-Sandy shutdown world. I enjoyed the R160s, but south of 14th St., the ride became something of a carnival trip. The conductor would flicker the lights while announcing repeatedly that the train would not be running south of Whitehall St. You’d have to be asleep to miss the ruckus. As the work on the Montague St. tube passes through its second month, subway riders seem to have adjusted. It’s too early to tell the overall impact of the shutdown, but I’ve definitely noticed larger crowds at Canal St. and more people waiting on the 4th Ave. platform at Atlantic Ave. for a Bay Ridge-bound train. It’s possible that rides are shorter as the trip over the bridge is faster than the R’s winding route through Lower Manhattan and Downtown Brooklyn, but multi-seat journeys just feel more annoying. The R train can sustain such a shutdown though because its ridership is relatively low. What about those other routes providing key connections between Brooklyn and Manhattan that were also damaged during Sandy? Earlier this week, reporters had an opportunity to grill MTA CEO and Chairman Tom Prendergast on future potential plans for Sandy-related shutdowns, and he hedged a bit. Prendergast was in charge of Transit during and after the storm, and he knows more about the state of the infrastructure that just about anyone. He wasn’t though in the mood to share much. 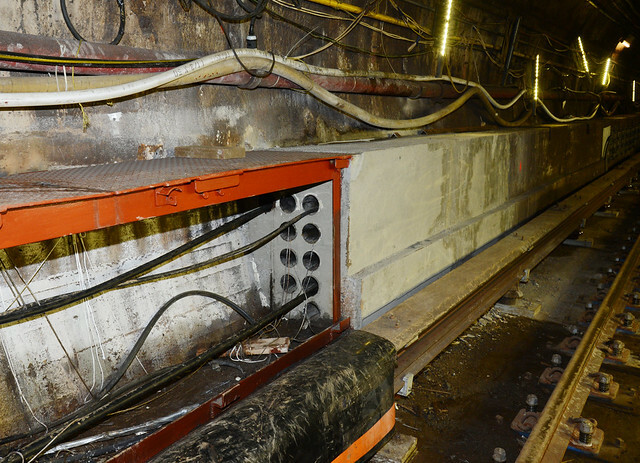 During the back-and-forth, he discussed the state of the other East River train tunnels, noting that nine of the tubes were damaged “pretty substantially.” “We know,” he said, “there are problems in the other tubes.” Problems is never good word when talking about metal surfaces and electronic components exposed to saltwater. Still, Prendergast wouldn’t give much information out on the status of the various tubes. He said that the Clark St. (2/3), Montague (R) and Cranberry St. (A/C) Tunnels bore the brunt of the flood. We also know from first-hand reports last year that the 53rd St. tunnel sustained water damage and that the L train’s 14th St. tube was inundate, but Prendergast didn’t mentioned those two tunnels by name. As reporters pressed him to explain the damage, Prendergast remained vague. “We don’t believe they’ll be the same order of magnitude, “he said, but the flooding occurred in nine out of 14 under-river tubes. Anything we can do on nightly closures is where the focus will be and then we look at weekend closures and then what we call an out-of-phase which is a permanent seven days ago for a number of months…Hopefully we can do it with nightly closures. If all of this reminds you of Donald Rumsfeld’s famous quote about the known knowns and known unknowns, well, I can see why. Something is coming, but we don’t know what. At some point, possibly in mid-to-late 2014 as the work on the Montague St. tunnel begins to wrap, we’ll hear more, but for now, the threat of future closures, to some degree or another, remains. Meanwhile, the MTA is racing against any future hurricane that could yet again bring floodwaters into the subways. Cross your fingers; hope for the best.